Pebble, the Kickstarter-funded smart watch, is headed to retail stores this Sunday, when Best Buy will begin carrying the iPhone-compatible Bluetooth accessory for $149.95. Best Buy will be the exclusive retail partner carrying Pebble watches, the company announced on Tuesday, starting with the "Jet Black" model. 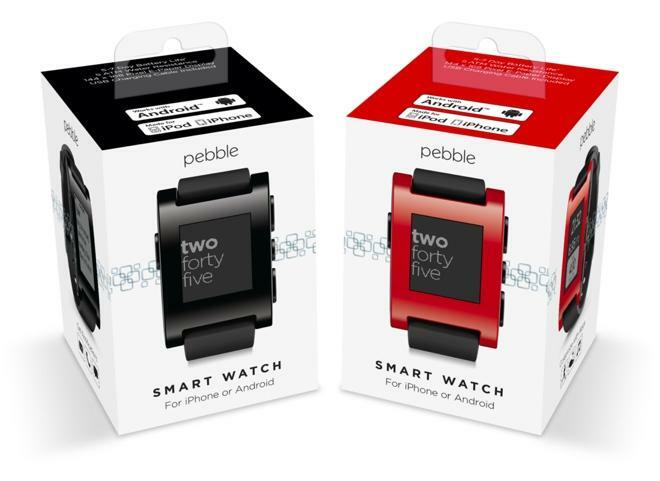 Customers will be able to buy online as of Tuesday, while retail locations will begin selling the Pebble on Sunday. "It's been so rewarding to see and share the great things our early backers and development partners have done with Pebble already," Pebble CEO Eric Migicovsky said. "Their work and our evolving app ecosystem has kept demand very high. Best Buy's partnership with us is a big step towards meeting that demand." The watch features an e-paper display and displays information from a connected smartphone, such as text messages, phone calls, emails, or even fitness data. It's compatible with both Apple's iOS and Google's Android. The Pebble band is fully customizable, compatible with any standard 22-millimeter strap. Following the "Jet Black" Pebbles, "Cherry Red" versions will become available in August. "The outpouring of support from our Kickstarter backers was the first signal to our team that Pebble's approach to smart, wearable technology was something the world was ready for," Migicovsky said. "We've learned that people want their Pebbles. Thanks to Best Buy, we're giving folks more ways to make that happen." The retail debut of Pebble comes as Apple is rumored to be working on its own smart watch accessory, potentially with biometric feedback. The company has been filing trademark applications for the name "iWatch" across the globe, lending some credibility to those rumors.